The AMP6 Oswestry Water Treatment Works (WTW) treats raw water from Lake Vyrnwy Reservoir; providing drinking quality water to one million domestic, commercial and industrial customers in Liverpool and parts of Cheshire. The raw water is fed 18 miles by gravity aqueducts from Lake Vyrnwy Reservoir, to the WTW from where treated water is gravity fed 50 miles by aqueduct pipelines to the supply service reservoirs in Merseyside and Cheshire. Once the upgrade project is completed the works will be able to provide up to 210Ml/d of drinking water to the latest standards, well into the future. The on-site construction works started early summer 2015 and including commissioning and performance trials, the project will be completed in summer 2017. 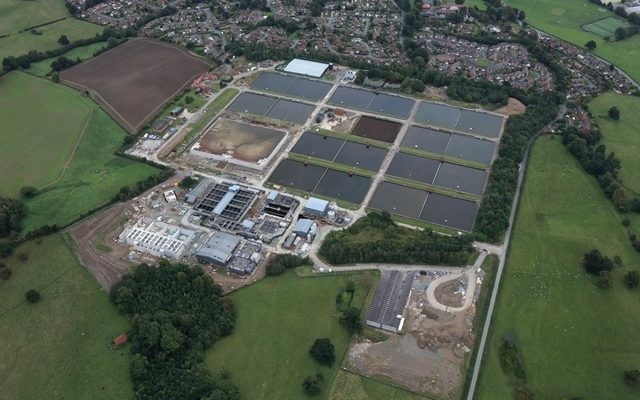 Once the Oswestry WTW upgrade project is complete, the existing direct filtration will have been superseded and the existing slow sand filters retired. The process includes oxidation of manganese in the raw water using chlorine dioxide, a powerful oxidant which will facilitate manganese removal. Chlorine dioxide is generated on site using a reaction of PurateTM (a stabilised solution of sodium chlorate and hydrogen peroxide) and sulphuric acid. The Kaplan type turbine is being provided to supply energy for the plant and off-site export. This together with the ecological precautions being taken to minimise the effect on local flora/fauna reflects the intentions for an environmentally friendly project. The use of Design for Manufacture and Assembly (DfMA) has been extensively used in the project. From concept stage the works have been developed to minimise effort on-site and seek production of all products that can be pre-made off-site. This means that less people are working on-site providing efficiencies and improvements in health, safety, quality and drive the programme. Overall this creates safer and more efficient construction. Over 11,000T of concrete has been precast off site for the project, with more than 700T of steel products fabricated and assembled before delivery. As a result of DfMA the amount of man hours not done on-site totals at 7,000hrs.